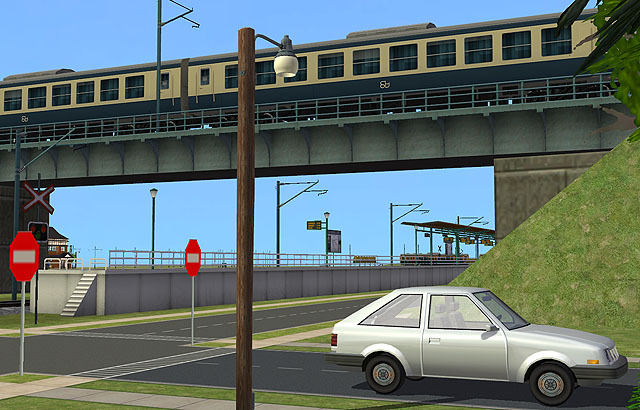 Did you ever think about a good looking railway with catenaries, railway bridges and all the stuff that goes through your neighborhood connecting it with some other places? 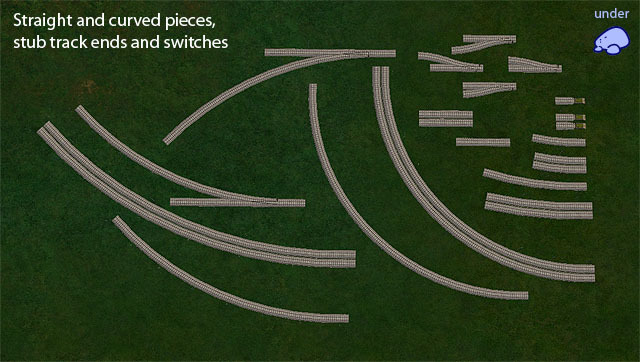 Existed railway ‘hood decorations can't satisfy your needs? 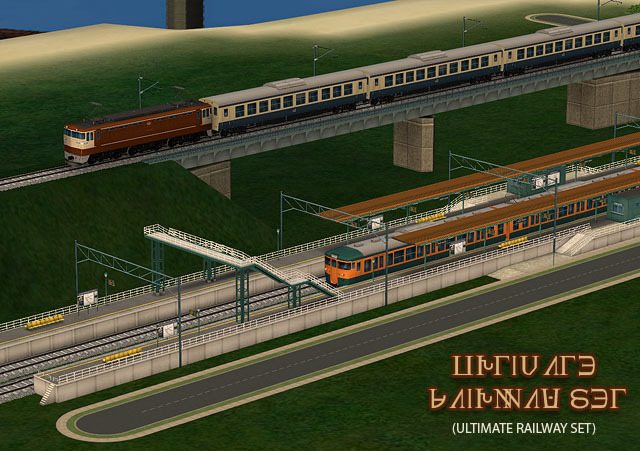 With this large set of custom ‘hood decorations, you can add a very detailed electric railway to your town. Some of the objects uses an extra large custom textures so use this set carefully if your computer isn’t strong enough. 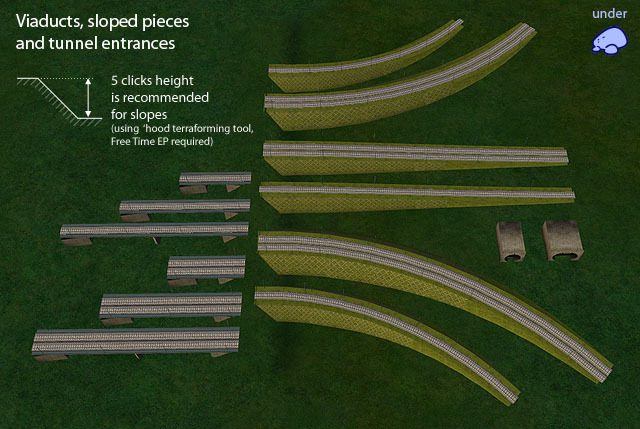 But it is also strongly recommended to have a Free Time EP installed, to be able to edit existing terrain, for better use of this set. All objects can be found under ‘Stones’ submenu of the neighborhood decorations menu (for better finding items you need since this submenu is not overcrowded yet). 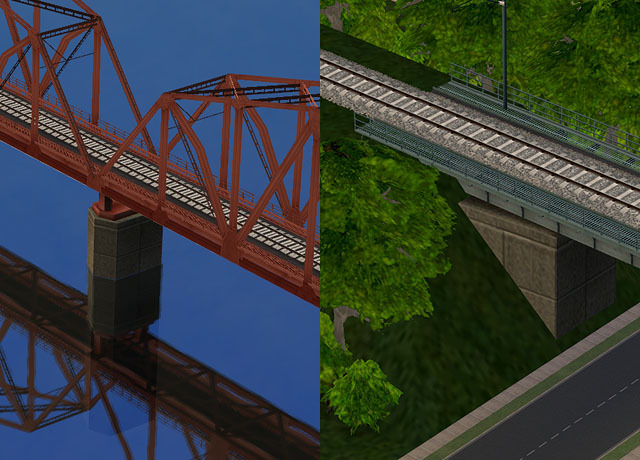 Railway bridges are about 40,30 and 20 tiles long (TS2 scale) that is about 10, 7 and 5 tiles long in Simcity4 scale – you can keep it in mind, when you creating a custom terrain map in Simcity4. 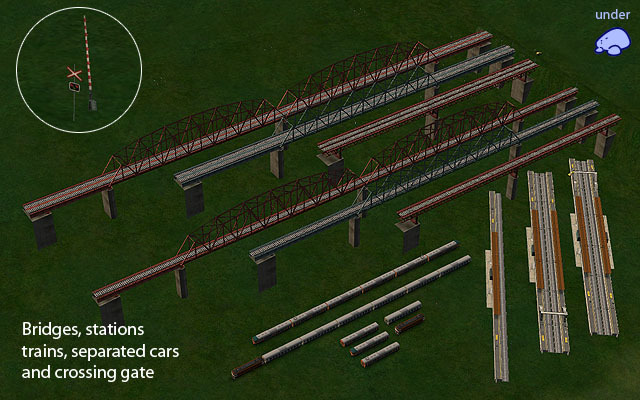 Railway overpasses (viaducts) are 10, 7 and 4 tiles long (TS2 scale), that is about 2, 1 and 1 tile long in Simcity4 scale so it’s almost impossible to make an embankment gaps for overpasses in Simcity4, so all the overpasses was designed for use with Free Time EP terraforming feature. 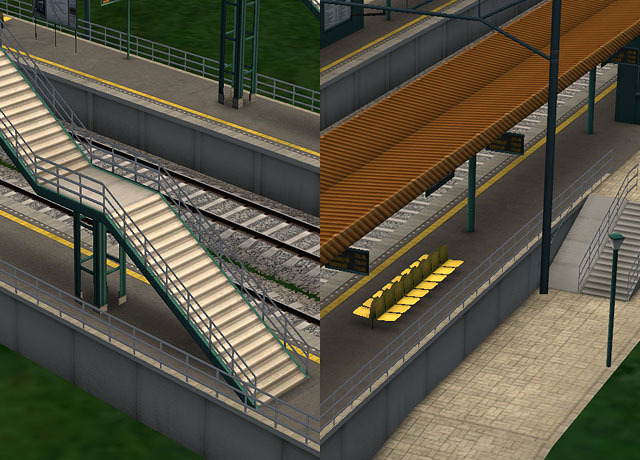 Optimal terrain level height difference for using sloped pieces (and overpasses as well) is 5 clicks of “raise” or “lower” tool that is available with Free Time EP terraforming feature, so if you want a road to go under a railway viaduct, you’ll need to lower the terrain with a road pieces for 5 clicks or raise terrain tiles with a railway pieces for 5 clicks (some times sunken roads are impossible if main terrain level is too close to the water level – road will just go under water). 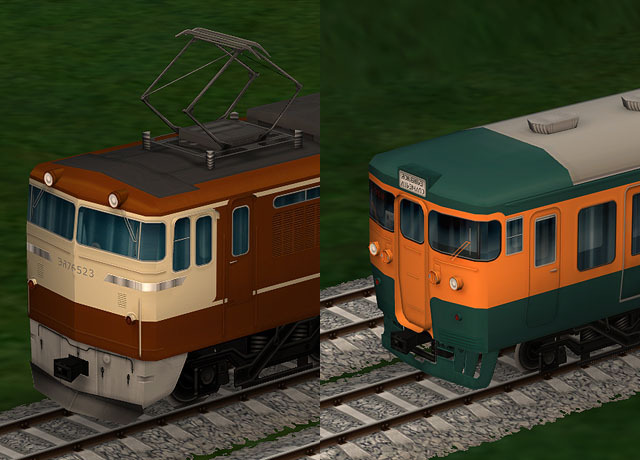 Thanks to MTS2 as allways!